Sometimes there comes a time when reviewing all of the Android compatible casinos out there gets to be a bit… dull. Don’t get me wrong, I love my job, its just that many online casinos out there today all use the same types of software. This creates a bunch of mobile casinos that are almost identical (and a bit boring). Once in a while though, there is a casino that will come through with something different. This can be as simple as the approach that the casino takes to delivering its mobile product, or as complex as introducing a new system altogether. Treasure Mile Casino is one of the latter, more innovative groups of betting spots. Coming here on my Android device to gamble was an outstanding experience. The platform is unique, the games are fun, and the banking and customer support are all really good. It may seem like I am letting the cat out of the bag a bit early in this review, but trust me: Treasure Mile Casino is one of the best Android betting sites you will ever come across. Want more details? Read on to learn more. Coming into Treasure Mile’s website on my HTC Droid DNA, I was met with an excellent website that conformed to my phone’s screen. I loved seeing the great bonuses available straight away, and the clear and concise way that the site gives you to register an account. When it comes to registering an account, you fill out a few fast forms on your Android device, which is about as fast and painless as possible. If playing an Android casino, I prefer to use an alternative keyboard input such as Swype to enter my information, as I find it to be much faster. When you are all registered, you can login using the standard method, or by using Facbook integration, which is much easier. I loved how this feature worked on my Android device, as it allowed me to get into the casino lobby much faster than normal. If you are a Facebook user, make sure to take advantage of this. It is a real time saver. After I was all set on the account side, I needed to fund my bankroll. As an American, there aren’t a lot of casino deposit options available to me. For worldwide players though, the story is different. Deposit methods accepted by Treasure Mile include: Visa, Fast Bank Transfer, UseMyWallet, GiroPay, iDeal, PaySafeCard, and Ukash. I had to use my Visa card, as the other options wouldn’t work for me. Fortunately, the whole process of actually getting the card inputted on my Android was very easy and the deposit process took a minute or so. My card was easily accepted, and I was quickly on my way to claiming my introductory deposit bonus. Claiming my bonus was as easy as getting a code from the customer support team after depositing. My chat agent “Ronnie” was very helpful and assisted me in getting my bonus, which was a 100% match bonus with a 40x rollover amount. While the rollover is a bit high, there was no maximum withdrawal amount. I commented earlier about how different Treasure Mile’s games, powered by Saucify and Rival Software, are. This is the absolute truth, and I simply cannot think of many other US friendly casinos that offer such a varied and unique set of games. Slots played very well on my device, and the animations and sounds were as clear and smooth on my phone. I really got a kick out of playing the army themed “Small Soldiers”, “Nascash”, and “Age of Spartans”. All are great games that translate well to the small screen. One thing I wish that Treasure Mile had was table games, as these are my favorite casino titles to play. There was no blackjack, no roulette, or poker to be seen here, which was a disappointment. Hopefully the software will update soon to include these, as I feel they are a necessity to any online casino. While there weren’t any table games, video poker was pretty prominent at Treasure Mile. The games were fun for me to play, which is saying something, as I usually detest video poker. Touch and feel were great on my Droid DNA, and offered the most responsive control I have seen with Android video poker. Another bad thing when betting online as an American is the limited withdrawal options you have at a casino. With that being said, I am extremely impressed with the number of options that Treasure Mile Casino offered me in terms of getting my money out of the casino. Options available to me were: Check delivered by FedEx, Check delivered by regular mail, Bank Transfer, and Credit Card Payment. Options available to other players throughout the world include: GiroPay, Skrill, EcoCard, Ukash, and all of the methods available to US players. I opted for the FedEx check, as it was listed as the fastest option. In order to get the payment processed, I had to submit some documents to verify my identity. This was no problem, and Treasure Mile’s banking department quickly processed my request. This was the only point in my Treasure Mile Experience that could not be accomplished on my Android device, as I needed to scan my driver’s license and some signed documents. I was able to initiate the process over my smartphone, but the rest should be completed through your PC. My check ended up getting to my house in four business days, which is very fast for an American friendly casino. I would dare say it is perhaps the fastest I have gotten a check, period! I was very impressed with the entire banking department, and feel that they are among the best in the US friendly market. 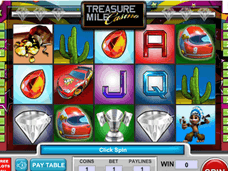 Overall, I feel that Treasure Mile is one of the absolute best Android casinos out there. The games are very fun and unique, and I was extremely impressed by the courteous staff and banking system, all of who worked to make my experience great. If you are looking to gamble on your Android, Treasure Mile is one of the first places you should go.